Cutting loose: Yorkshire's Joe Root on the way to his match-saving unbeaten century. In 2012, during his county’s Championship promotion year and before he had debuted for England, he hit a majestic 222 not out as an opening batsman in a heavily rain-affected draw with Hampshire. It left many onlookers purring and the man himself brimming with confidence after a breakthrough knock. 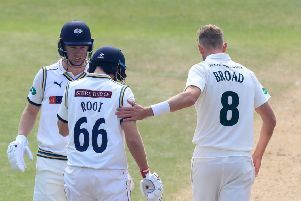 England’s Test captain Root will play for Yorkshire against Hampshire at the same venue from tomorrow in his second successive County Championship appearance as he warms up for a bumper summer of World Cup and Ashes cricket. In Yorkshire’s season opener, against Nottinghamshire at Trent Bridge this week, he scored 73 before his unbeaten 130 helped steer them to a final-day draw. On the 2012 Ageas Bowl game, Root recalled: “It was a strange one really because the game was badly affected by the weather. “It was early on in my career, and it was one of those days where everything just fell into place nicely. “I got through some difficult periods on a surface which was quite challenging, but more than anything I managed to construct a big score. “That innings was a massive part in my development as a top-order batsman. “From that point onwards it gave me a lot of confidence knowing how to construct a long innings and gave me a base to look back on. That innings was the first of five career double-hundreds to date; three for Yorkshire in the Championship and two in Tests for England. Root went on to debut in Tests for England at the end of 2012 in India and has not looked back. This summer he will almost certainly go beyond the 13,000-run mark in all international cricket (he currently has 12,621). Yorkshire captain Steve Patterson played in that game at the Ageas Bowl in 2012 and was the next best scorer in an innings of 350-9 declared with 37. He said: “It was a cold week, we didn’t play a full game, and the pitch was tricky as a result. “Nobody could really read it and get in to post a decent score. “But it’s one of those where one player seems to be playing a different game to everyone else, and that’s exactly what Joe did. “We were talking about it in the dressing room at Notts, trying to remember what Rooty’s best knocks for Yorkshire have been – and that was mentioned as one that will always stand out. In his younger days before he established himself as an international it showed just how good he could be and how he was destined to be one of the very best. “The other one that Rooty mentioned was up at Durham the year after. “They’d set us just under 340 to win on a tough pitch again, and he got 180-odd. He was out with a couple of runs needed, and we ended up winning by three or four wickets. It was another really special innings. While Yorkshire drew with Notts, Hampshire claimed a home opening-round win over Essex. Tim Bresnan is back in contention for Yorkshire, having recovered from a back injury.